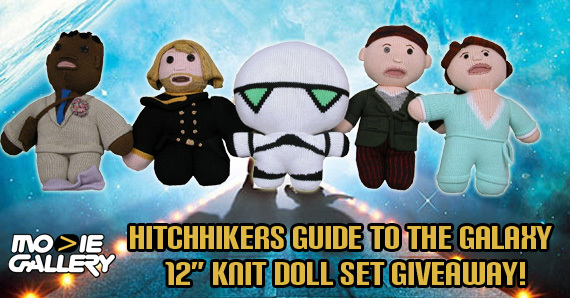 After our last bloody Sean of the Dead giveaway, you’ll “Mos Def” want to wrap your arms around this week’s lovable gang of knit dolls from The Hitchhiker’s Guide to the Galaxy! Hang tight for misadventures through time and space — just stick out your thumb! This is a complete (and completely huggable) set of all five knit plushes made in honor of the movie! Space travel in the sci-fi comedy The Hitchhiker’s Guide to the Galaxy is powered by the fantastic Infinite Improbability Drive, which lets a ship pass through every point in every universe simultaneously. Unfortunately, as the name might suggest, improbable things tend to happen to the people using it… like being turned into adorable knitted dolls. These 12″ plushes are copies of the props used in the movie when that exact thing happens. The set of five includes Arthur Dent, Ford Prefect, Trillian, Zaphod Beeblebrox, and Marvin the Paranoid Android. This entry was posted in Contests & Giveaways, The MG Blog by mgadmin. Bookmark the permalink.